Original VICTOR KALIN Art - BETTY GRABLE Paper Dolls #1558 Merrill 1951 Cover Art plus 8 Pages of Clothes. The cover board measues 34"x22" and the clothing boards are approximately 22x14. Except for one page where the board is a little larger. The cover is by Victor Kalin but the clothing pages are credited to Mrs. Over the course of the year, I will be listing a couple hundred pieces of original art from The Merrill Company Publishers so make sure you bookmark my listings. Feel free to contact me about something I haven't listed yet. 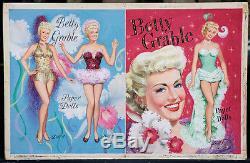 The item "Original 1951 VICTOR KALIN Art BETTY GRABLE Paper Dolls (A183)" is in sale since Friday, April 07, 2017. This item is in the category "Entertainment Memorabilia\Movie Memorabilia\Other Movie Memorabilia". The seller is "olebuttonz" and is located in New York, New York. This item can be shipped worldwide.